One of the smartest things I did was to enlist in the military back in 1973. My draft number was in the low 30s and it was a certainty that I would have been drafted anyway. There were options, like turning to clout to avoid being sent overseas to fight in Vietnam. That’s what kept George W. Bush out of active duty military service. His father and pals helped get him a cushy job that he didn’t always show up for in the reserves. Keep in mind, the reserves during the Vietnam War was not like the reserves today. During the draft, you couldn’t enlist in the reserves. You needed clout. You had to be a “fortunate son,” as John Fogerty sang with his band Credence Clearwater Revival. Fogerty was talking about the privileged children of then President Richard M. Nixon. Politicians love to put on the uniform but so few of them served active duty when the opportunity was there. Former CBS News anchor Dan Rather is the focus of a new film called “Truth” starring Robert Redford that explores the issue of politics, clout and Bush avoiding military service. Rather lost his job reporting Bush used clout to avoid military service, but the conservative right ramped up to dirty him up, as they did Senator John Kerry. Rather was a great journalist, and one of the first journalist victims of the rise of conservative fanaticism. I served during the Vietnam War but they never sent me overseas. I was trained for it. I was ready to go. But as the war wound down, I trained in a hospital and later served at an F-111 Air Force Base in Idaho. At least I served and was ready to go overseas. It wasn’t my choice. Had it been, I would have gone. I also served more than 10 years in the Illinois Air National Guard during the 1980s and 1990s and there were far less problems there. You can read my story about American Arab veterans at Al Jazeera English. Many people think anti-Arab and anti-Muslim racism began after the terrorists attacked America on Sept. 11, 2001. But that’s just not true. America was hostile to Arabs long before Sept. 11. The day I was honorably discharged from active duty, the FBI opened an investigation into me that lasted two years. I have the lengthy report they wrote, with all the blacked out lines. The FBI “suspected” I was a “terrorist” but concluded I was only concerned about bettering my American Arab community. How much taxpayer dollars did the government waste investigating me and coming to that obvious conclusion? Power in this country comes from communications. Journalists have a lot to do with deciding what is or isn’t news: Like the fact Chicago Mayor Rahm Emanuel never served in the U.S. Military. Instead, Emanuel volunteered and wore the uniform of the Israeli military. His animosity towards Arabs is one reason why Emanuel has shut down the annual Arab American Heritage Month, which the city began in the 1980s but ended only when Emanuel came to office. And, it’s one reason why Mayor Emanuel cowardly refuses to grant me an interview. None of the mainstream American journalists covering him at Chicago City Hall have the courage to ask or report on that. None served in the military either, I guess. So what’s so surprising? Oh yea, November is Arab American Heritage Month. I guess Emanuel and his buddy, Illinois Governor Bruce Rauner — who punishes Americans who criticize Israel by denying them state taxpayer funds — forgot! 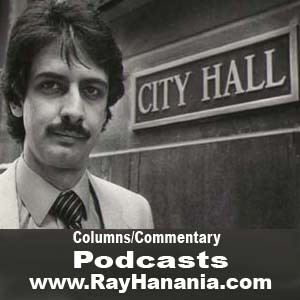 Ray Hanania is an award-winning Palestinian American columnist, managing editor of The Arab Daily News at http://www.TheArabDailyNews.com, and writer at Al Jazeera English. Follow him on Twitter @RayHanania. To find out more about Ray Hanania and read features by other Creators Syndicate writers and cartoonists, visit http://www.creators.com. COPYRIGHT 2015 CREATORS.COM.